The great high-energy physics conference ICHEP 2018 is over and, as usual, I spend some words about it. The big collaborations of CERN presented their last results. I think the most relevant of this is about the evidence ( ) that the Standard Model is at odds with the measurement of spin correlation between top-antitop pair of quarks. More is given in the ATLAS communicate. As expected, increasing precision proves to be rewarding. The news is that the error is diminished and both agrees. They show a small tension, 13% and 17% respectively, but the overall result is consistent with the Standard Model. When the different contributions are unpacked in the respective contributions due to different processes, CMS claims some tensions in the WW decay that should be taken under scrutiny in the future (see here). They presented the results from data and so, there is no significant improvement, for the moment, with respect to Moriond conference this year. The situation is rather better for the ZZ decay where no tension appears and the agreement with the Standard Model is there in all its glory (see here). Things are quite different, but not too much, for ATLAS as in this case they observe some tensions but these are all below (see here). For the WW decay, ATLAS does not see anything above (see here). So, although there is something to take under attention with the increase of data, that will reach this year, but the Standard Model is in good health with respect to the Higgs sector even if there is a lot to be answered yet and precision measurements are the main tool. The correlation in the tt pair is absolutely promising and we should hope this will be confirmed a discovery. Last week I have been in Montpellier to attend QCD 17 Conference hosted at the CNRS and whose mainly organizer is Stephan Narison. At this conference participates a lot of people from CERN presenting new results very nearly to the main summer conferences. This year, QCD 17 was in conjuction with EPSHEP 2017 were the new results coming from LHC were firstly presented. This means that the contents of the talks in the two conferences just superposed in a matter of few hours. The result is still there but with a somewhat sober presentation. What does this mean? Presently, this amounts to very few. We are still within the Standard Model even if something seems to peep out. In order to claim a discovery, this effect should be seen with a lower error and at CMS too. The implications would be that there could be a more complex spectrum of the Higgs sector with a possible new understanding of naturalness if such a spectrum would not have a formal upper bound. People at CERN promised more data coming in the next weeks. Let us see what will happen to this small effect. ATLAS and CMS nuked our illusions on that bump. More than 500 papers were written on it and some of them went through Physical Review Letters. Now, we are contemplating the ruins of that house of cards. This says a lot about the situation in hep in these days. It should be emphasized that people at CERN warned that that data were not enough to draw a conclusion and if they fix the threshold at a reason must exist. But carelessness acts are common today if you are a theorist and no input from experiment is coming for long. It should be said that the fact that LHC could confirm the Standard Model and nothing else is one of the possibilities. We should hope that a larger accelerator could be built, after LHC decommissioning, as there is a long way to the Planck energy that we do not know how to probe yet. What does it remain? I think there is a lot yet. My analysis of the Higgs sector is still there to be checked as I will explain in a moment but this is just another way to treat the equations of the Standard Model, not beyond it. Besides, for the end of the year they will reach , almost triplicating the actual integrated luminosity and something interesting could ever pop out. There are a lot of years of results ahead and there is no need to despair. Just to wait. This is one of the most important activities of a theorist. Impatience does not work in physics and mostly for hep. About the signal strength, things seem yet too far to be settled. I hope to see better figures for the end of the year. ATLAS is off the mark, going well beyond unity for WW, as happened before. CMS claimed for WW decay, worsening their excellent measurement of reached in Run I. CMS agrees fairly well with my computations but I should warn that the error bar is yet too large and now is even worse. I remember that the signal strength is obtained by the ratio of the measured cross section to the one obtained from the Standard Model. The fact that is smaller does not necessarily mean that we are beyond the Standard Model but that we are just solving the Higgs sector in a different way than standard perturbation theory. This solution entails higher excitations of the Higgs field but they are strongly depressed and very difficult to observe now. The only mark could be the signal strength for the observed Higgs particle. Finally, the ZZ channel is significantly less sensible and error bars are so large that one can accommodate whatever she likes yet. Overproduction seen by ATLAS is just a fluctuation that will go away in the future. The final sentence to this post is what we have largely heard in these days: Standard Model rules. LHCP2016 is running yet with further analysis on 2015 data by people at CERN. We all have seen the history unfolding since the epochal event on 4 July 2012 where the announcement of the great discovery happened. Since then, also Kibble passed away. What is still there is our need of a deep understanding of the Higgs sector of the Standard Model. Quite recently, LHC restarted operations at the top achievable and data are gathered and analysed in view of the summer conferences. The scalar particle observed at CERN has a mass of about 125 GeV. Data gathered on 2015 seem to indicate a further state at 750 GeV but this is yet to be confirmed. Anyway, both ATLAS and CMS see this bump in the data and this seems to follow the story of the discovery of the Higgs particle. But we have not a fully understanding of the Higgs sector yet. The reason is that, in run I, gathered data were not enough to reduce the error bars to such small values to decide if Standard Model wins or not. Besides, as shown by run II, further excitations seem to pop up. So, several theoretical proposals for the Higgs sector still stand up and could be also confirmed already in August this year. Indeed, there are great news already in the data presented at LHCP2016. 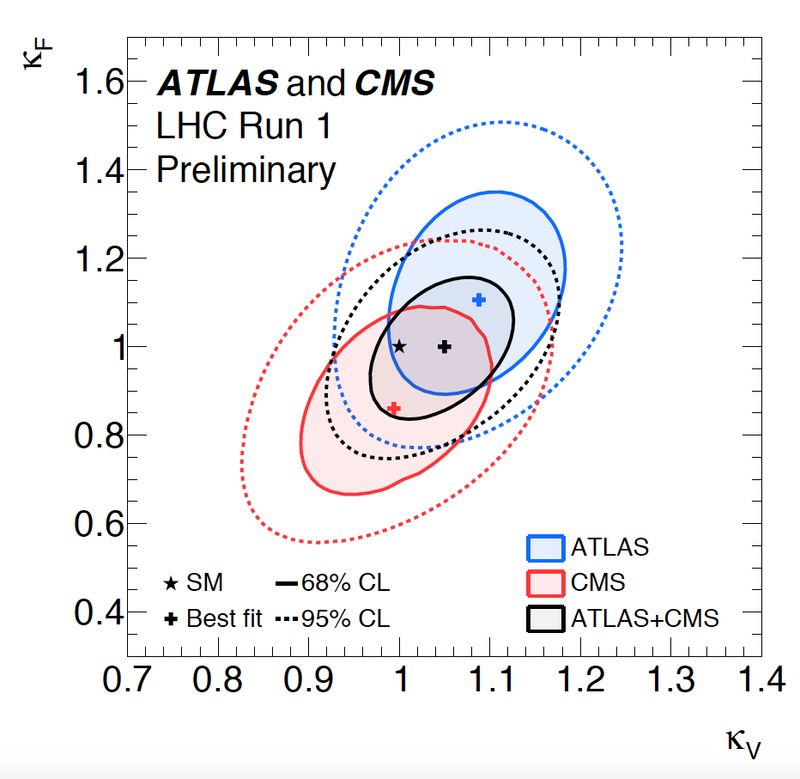 As I pointed out here, there is a curious behavior of the strengths of the signals of Higgs decay in and some tension, even if small, appeared between ATLAS and CMS results. Indeed, ATLAS seemed to have seen more events than CMS moving these contributions well beyond the unit value but, as CMS had them somewhat below, the average was the expected unity agreeing with expectations from the Standard Model. The strength of the signals is essential to understand if the propagator of the Higgs field is the usual free particle one or has some factor reducing it significantly with contributions from higher states summing up to unity. In this case, the observed state at 125 GeV would be just the ground state of a tower of particles being its excited states. As I showed recently, this is not physics beyond the Standard Model, rather is obtained by solving exactly the quantum equations of motion of the Higgs sector (see here). This is done considering the other fields interacting with the Higgs field just a perturbation. From the table one can see that the signal strengths for decays in ATLAS are somewhat beyond unity while in CMS these are practically unity for but, more interestingly, 0.85 for . But we know that data gathered for decay are largely more than for decay. The error bars are large enough to be not a concern here. 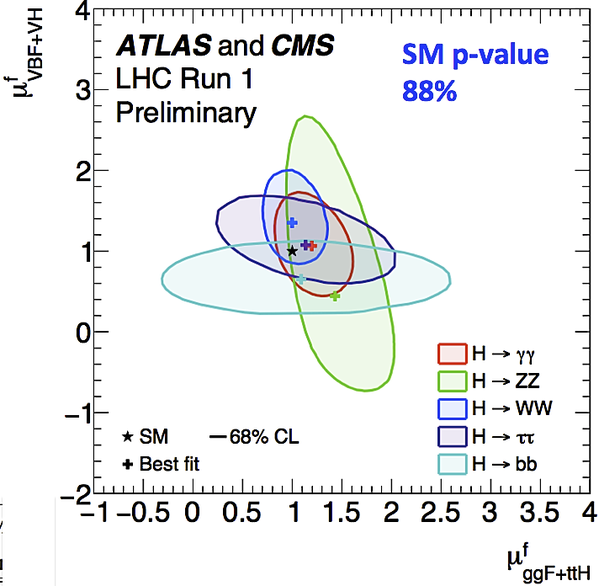 The value 0.85 is really in agreement with the already cited exact computations from the Higgs sector but, within the error, in overall agreement with the Standard Model. This seems to point toward on overestimated number of events in ATLAS but a somewhat reduced number of events in CMS, at least for decay. This result is striking per se as shows a tendency toward a decreasing value when, in precedence, it was around unity. Now it is aligned with the value seen at CMS for the decay! The value seen is again in agreement with that given in the exact solution of the Higgs sector. And ATLAS? This is the most shocking result: They see a significant reduced set of events and the signal strength they obtain is now aligned to the one of CMS (see Strandberg’s talk at page 11). What should one conclude from this? If the state at 750 GeV should be confirmed, as the spectrum given by the exact solution of the Higgs sector is given by an integer multiplied by a mass, this would be at . Together with the production strengths, if further data will confirm them, the proper scenario for the breaking of electroweak symmetry is exactly the one described by the exact solution. Of course, this should be obviously true but an experimental confirmation is essential for a lot of reasons, last but not least the form of the Higgs potential that, if the numbers are these, the one postulated in the sixties would be the correct one. An other important reason is that coupling with other matter does not change the spectrum of the theory in a significant way. So, to answer to the question of the title remains to wait a few weeks. Then, summer conferences will start and, paraphrasing Coleman: God knows, I know and by the end of the summer we all know. In this plot you can see that the Standard Model, represented by a star, is somewhat at the border of the areas of the ZZ and WW decays and that of the WW decay is making smaller. This does not imply that in the future deviations from the Standard Model will be seen here but leave the impression that this could happen in run 2 with the increasing precision expected for these measurements. The strengths are so interesting because the Higgs sector of the Standard Model can be solved exactly with the propagator providing the values of them (see here). These generally disagree from those obtained by standard perturbation theory even if by a small extent. Besides, Higgs particle should have internal degrees of freedom living also in higher excited states. All of this to be seen at run 2 as the production rate of these states appears to be smaller as higher is their mass. Run 2 is currently ongoing even if the expected luminosity will not be reached for this year. For sure, the next year summer conferences could provide a wealth of shocking new results. Hints are already seen by both the main collaborations and LHCb. Something new is just behind the corner.